If not for the intervention of Philadelphia Flyers star Jaromir Jagr, one of the most storied hockey programs in Europe likely would have died a painful death. Earlier this year, Jagr rescued his financially troubled hometown team, HC Rytiri Kladno (the Kladno Knights), by becoming its owner and team president. Since then, Jagr has begun the process of trying to bring the once-proud program back to respectability in the Czech Extraliga. He readily acknowledges that the process will take time and patience. "It's not going to happen overnight," he told NHL.com. "We have to become stable again across the entire organization, on the ice and also (in terms of) finance. Of course, I want to win on the ice, but it's going to take time." Currently, Kladno is 10th in the 14-team Czech Extraliga. That alone represents some improvement, as the team finished last in each of the two previous seasons. The Knights were bolstered in the first month of the regular season by the presence of former NHL forward Jan Hlavac, who opened the season in his home country for reasons of avoiding a tax levied on foreign players in Sweden's Elitserien. However, by prior arrangement, Hlavac has left for his Swedish club, Linköpings HC. The top players on HC Kladno now are veteran local products Jaroslav Kalla and Pavel Patera, Slovakian center Marek Hovarka, forward Michal Dragoun and defenseman Milan Toman. The 31-year-old Kalla leads the team in scoring (10 goals, 16 points in 19 games). Patera (4 goals, 11 points), who had a short NHL run with Dallas and Minnesota and who is an old friend of Jagr's, lends his experience to coach Zdenek Vojta's club. Now in the seventh season of his fourth stint with the club, the 39-year-old Patera serves as a reminder of a time when Kladno not only was known for its steel industry -- which has experienced plenty of turmoil over the years -- but also for its hockey school that produced a spate of NHL and international hockey stars. Along with his longtime linemates, Martin Prochazka and Otakar Vejvoda Jr., Patera once was part of arguably the most dominant line in European hockey during the mid-1990s. For his part, Jagr says his focus is not on how particular players are faring this season but on how the team and organization are doing as a whole. "It's a different way of thinking from being a player," Jagr said. "As a player, you focus on the next game, worry about your own play and the system. As owner, there are a lot of different details and you look at the big picture." Jagr admits it has been a bit of an adjustment trying to re-acclimate to the NHL after a three-year absence while dealing with the new responsibilities of owning a team in Europe. He does not want to be an absentee owner, but can't always devote as much time as he'd like because of the demands of his own career. "It is (a balancing act), but the NHL and Flyers come first all season," he said. "During the offseason, I spent three months with the ownership (approved in May). A lot of it was finance stuff, and also the contracts with the players. It's harder to run things when I'm over here, but I stay in contact with my business partner and the coach as much as I can. At the same time, I have to devote 100 percent to the Flyers, too." 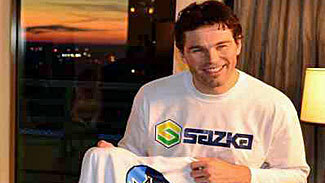 How does Jagr think the juggling act is going so far? "OK," he said with a grin. "It's something new; a learning experience." For many years, Jagr considered the idea of eventually trying to take a more active role in the club that gave him his start in hockey. His aging father, Jaromir Sr., served as club president until last season, in conjunction with the local municipality. "I felt now was time, because the team was in trouble and probably would have had to give up its license to play in the Extraliga, because the debt was out of control," Jagr said. In local elections held in October 2010, Jagr Sr. ran for the "Choice for Kladno" party in order to preserve declining municipal subsidies -- an extremely controversial issue in a town where some argued it needs a financially viable hockey team to continue sustaining the local economy and provide jobs, while opponents said it diverted funding from needed local services. Last February, the younger Jagr agreed to take over the post from his then 70-year-old father. In May of this year, he reached an agreement for the team to become a limited liability company (LLC), with himself as the majority owner and the Kladno town council holding a minority share. As part of the deal, Jagr has the right to block any council motion to sell the team's Extraliga license or fold the club. He also retains primary control of how local revenues get channeled into the hockey program. The council exercises a greater degree of control in making sure that finances put into the club also benefit the local economy. "It was a lot of work and negotiation," Jagr said. "Now we have to move forward over the next few years to get the organization back on track." Jagr emphasized that he is not looking for quick fixes. Without much budget to spend on high-priced talent -- today's Extraliga largely is dominated by older Czech veterans who have returned home after playing in the NHL and/or higher-paying European leagues -- replenishing its once seemingly endless well of young talent is the first priority. "I don't think it can ever go back (to the way it used to be), even to 10 years ago, because the times are different," Jagr said. "But the youth hockey development always needs to be the first focus. We need to bring in young players to play and give them the right coaching and opportunity. Then we have a chance." Currently, there are about 450 youth- and junior-age players in the Kladno system, with programs starting from the time children are age 4 and progressing up through the senior level. Located in Central Bohemia about 15 miles northwest of Prague, Kladno is a city of 70,000 residents. The local hockey team was founded in 1924. Among recent notable NHL players apart from Jagr who either hail from the city or at least got their hockey start within the HC Kladno program are Jakub Voracek, Tomas Plekanec, Patrik Elias, Tomas Kaberle, Ondrej Pavelec, Tomas Vokoun, Michal Frolik and Marek Zidlicky. Past NHL or international hockey standouts with ties to Kladno and its team include Michal Pivonka, Frantisek Kaberle (Sr. and Jr.), Milan Novy, Otakar Vejvoda (Sr. and Jr.) Frantisek Pospisil, Patera and Prochazka. HC Kladno has not won a Czech championship since the current Extraliga was formed 18 years ago. Although a contender at times in the 1990s, the new millennium has seen more downs than ups. The financially troubled team had difficulty keeping sponsors for more than a year or two, and the revenues as a whole declined severely. Jagr is not promising any miracles for the Knights now that a new era has begun, but he does see signs of hope for the long term. For years, he has pledged to play his final season as an active player -- whenever that time may come -- wearing the HC Kladno uniform. "Yes," he said when asked if that plan still holds. "But there is business to take care of now, here (in the NHL) and there. For the future, we'll see what happens. I want to do my best."